Every now and then, a handset manufacturer decides to go after the female demograpghic of the smartphone market. We can even remember when Verizon marketed the Palm Pre Plus as a great phone for Mom. The HTC Rhyme was a handset that featured a plum colored casing and a charm indicator that lit up whenever the phone needed attention. When launched, Verizon skewed the marketing of the device toward the female persuasion. Now, we have a whole new model made for women. Miami based handset manufacturer BLU Products has launched the BLU Armour. The target audience for the phone will appreciate the home button which is actually a Swarovski Zirconia. The back is a white quilted design. But based on the company's press release, it would seem that the manufacturer believes in a bit of hyperbole. For example, the BLU Armour sports a dual-core 1GHz processor "for fast browsing" and the phone's 5MP camera allows you to "take brilliant photos and flawless portraits". The full specs include a 4 inch curved glass display with resolution of 480 x 800 (WVGA). A MediaTek dual-core 1GHz processor is under the hood along with the PowerVR SGX 531 GPU. On board is 512MB of RAM and the 4GB of native storage can be expanded using the 32GB capacity 32GB microSD slot. The 5MP rear-facing camera captures 720p video at 30fps, and there is a .3MP snapper around front for self-portraits and video chats. A 1600mAh battery keeps the gerbil spinning on the wheel and Android 4.0 is pre-installed. There is 3G and EDGE connectivity and the phone is set up with dual SIM slots. So here is a phone that tries to look good on the outside, but has some pretty low-end specs. When you see the price, it will all come together. The BLU Armour is priced at $159 through several online retailers such as Amazon. And that is an off-contract price. Retailers in Brazil, Mexico and other Latin American countries will also be offering the phone. 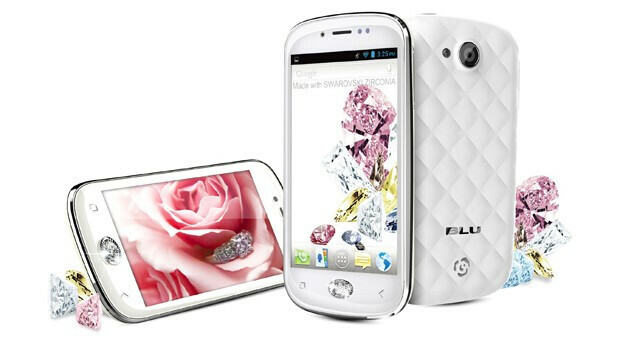 MIAMI, May 31, 2013 /PRNewswire/ -- BLU Products, a leading mobile phone provider, today announced the BLU Amour, designed for the woman with exquisite taste, sophistication and an amazing personality. This target audience will appreciate the BLU Amour's pearly-white quilted back cover, gently curved glass touch panel, as well as the ergonomically designed diamond simulant, Swarovski Zirconia. In addition, the BLU Amour features a stylish uniquely designed user interface resulting in an equally stunning user experience, and luxurious theme. The new fashionable smartphone will be on display at the JCK Las Vegas Show – the leading jewelry event in North America, May 31st- June 3rd at the Swarovski exhibit located at Shorelines, Level 2 booth in the Plumb Club Pavilion, PC-365 at the Mandalay Bay Convention Center.